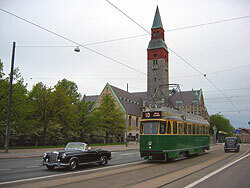 We offer guided tram tours in Helsinki. You can plan the route yourself, or if you so wish, we will make a suggestion of the route. On a guided tour, the guide will tell you about the sights along the route and about the tram traffic in Helsinki. The tour can be conducted in English, Finnish or Swedish.